Seattle City Business License If you have a City of Seattle address, you need to list your City of Seattle Business License. This is is a city requirement. 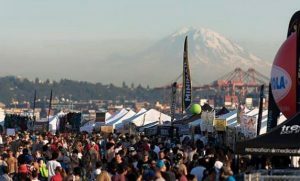 You can obtain your City Business License HERE If you do not have a city of Seattle Business license there is a $30 Trade Show fee that is passed through to the City. Vending Booth Directory Be sure to purchase a listing in our online Vendor Booth Directory. 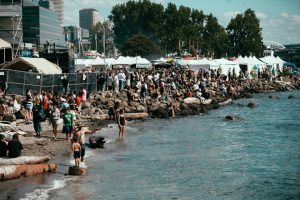 Be seen where the Hempfest attendee goes to plan their Hempfest adventure and make sure they can find you afterwards! Includes up to 3 images, hyperlinks, & direct messaging capabilities. This includes a link to your Directory page from our online map! This comes with all sponsorship packages. Program Map Highlight Make sure your booth stands out among the masses! Your location highlighted in our collectable Event Program. Make sure your customers can find you! This is exclusive to the first 20 purchasers & our sponsors only! 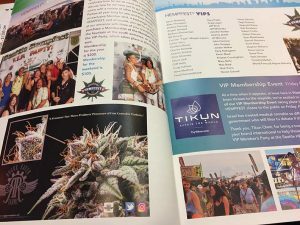 Advertise in our event program Our magazine style annual Event Program is a must have for our attendees! Make sure your brand is in the forefront and getting the maximum exposure! Sizes range from 1/8 to full pages. Advertising is included in all our sponsorship packages and can be purchased on the vending application. 10% Vending Commission On Sunday night at 6:00 pm we will begin collecting the 10% of sales or $30 per 10×10 booth, which ever is more, vending commissions. If you did not sell anything, you simply pay the $30 per 10×10 booth minimum. This is a requirement of the City of Seattle. The form was in your vendor packet when you checked in. You cannot load out until you have paid. Please do so and give your driver the receipt paperwork as they require it to gain entry to the park for load out Sunday night. There is no exception to this requirement. Insurance Requirement Vendors shall provide general liability insurance in the following amounts: No less than $1,000,000 per occurrence for vendors with tent size of 10’x10’ or smaller. No less than $2,000,000 per occurrence for vendors with large concessions, stage, fencing, tents bigger than 10’x10’. Naming the City of Seattle, Port of Seattle, & Seattle Events as additionally insured. Map Review our Map page to select your location. Of course we are here to help you select the best available location. Remember that the map is subject to change! On rare occasion they add a feature to the park which requires us to relocate booths. We will make every effort to assure you are aware in advance if this occurs. You are vending in a park and will be on dirt, grass, or a combination of the two. The ground will not be perfectly flat. It may rain and you could be dealing with mud & puddles so be prepared! Cancellations All cancellations require the cancellation form to be filled out and will result in a 30% cancellation charge. No cancellations will be taken after June 1. Please email [email protected] to obtain the cancellation form. Tire Wood The City requires that all vehicles park their tires on wood. This typically means you need 4 – 16×16, 1/2″ thick plywood pieces to park each of your tires on. Sponsors are supplied wood for two vehicles upon initial load in. Vendors will have the option to purchase wood on the application or can bring their own. Be aware that we do a wood check and cannot allow anyone without their tire wood to enter the park. Please be sure and have this wood with you each time you enter the park or we cannot allow you back in via permit requirement!!! Event Hours The event hours are from 12 Noon to 8 pm on Friday, and 10 am to 8 pm on both Saturday and Sunday. We require that vendors be open during those hours for all three days. Lodging Our Accommodations page has a the best deals for your stay. 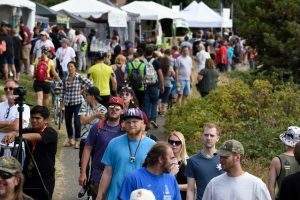 Seattle is very busy in August and lodging space historically fills up quickly. You are not permitted to camp or sleep in Centennial, Myrtle Edwards Park, Olympic Sculpture Park, or any City streets or property. Parking There is no parking on site. Our Parking has information on pre-purchasing parking at the 101 Elliott Avenue Garage which is just beneath the Seattle PI Globe near the Main Stage Bridge entrance. It’s a huge relief to not worry about where you will park at so please check it out! Canopies, Tables, Chairs, Banner Poles, & Power. Sponsors are provided rental items, including power, as part of their sponsorships. 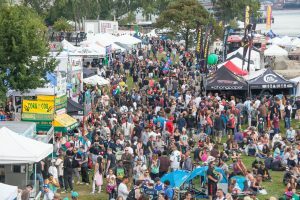 Rental of canopies, tables, chairs, banner poles, & power are available for everyone else. It’s super nice to have your canopy set up waiting for you when you arrive! When you arrive the first time our QM department will be notified and your rented tables, chairs, & banner poles will be delivered to you shortly. You’ll be provided with a cell phone number to call should they not arrive in a timely fashion. Remember, we are a volunteer powered event so your patience is appreciated! You are responsible for rented items. You will be billed replacement value for any damaged or missing items. 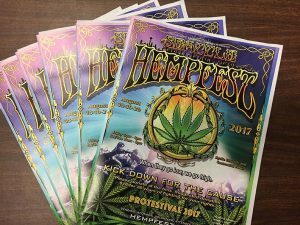 You are responsible for sealing your canopy w/all the rented items inside when you pack out of Hempfest each night. If you bring your own canopy, you should be prepared for occasional windy conditions on the waterfront. Please secure your canopies with some form of weight system (i.e. sandbags, cinder blocks, water container). You are responsible for maintaining the space in and around your booth. We ask that everyone be respectful of each other when loading in and out of the park and to leave the area as clean as possible. Please join us in our “leave no trace” creed. Pack it in, pack it out! Ice We pre-sell ice on the application and only purchase what we’ve sold. There are no on site ice sales. 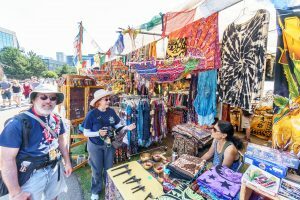 It comes in 20# bags and is distributed from a truck parked at our Main Stage Bridge entrance, at the Munchie Market food area. Food Vendor Services & Inspections We both hot water hand washing & dish washing at both the Munchie Market & Ganja Gardens food areas. Bud of Seattle has hot water hand washing. All 3 areas have private restrooms for food vending staff. The Fire Marshall & Health Department are on site Thursday & Friday checking for proper fire extinguishers & permits. We do have a limited number of Fire Extinguishers for sale on site and cannot guarantee their availability. Anyone not complying with both Fire Marshall & Health Department codes will be required to leave and no refund shall be given. It’s their laws and enforcement and nothing we control. Payment Due Upon Application Your’e required to pay for your booth upon application. We take Visa & MasterCard. Until payment is made no booths are saved for you. You will be sent an invoice once you’ve completed the application. No dispensing or distributing any controlled substances whatsoever, including medicinal goods and seeds. 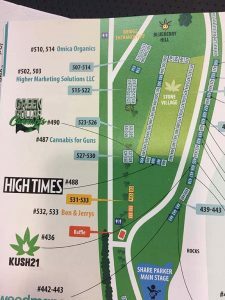 You are also not allowed to consume cannabis within your booth boundaries.